Insufficient storage available, Storage space is running out, Phone storage is getting low these terms sound quite familiar when your Android device is facing low disk storage errors. SD Cards help to expand your Android device storage to great extent, you are no more limited to the built in storage capacity of your Android device which usually varies from 4GB – 16GB. With this limited storage capacity you are left with no option as in many cases the internal built in device storage isn’t enough. Music addicts usually fill up their devices with tons of MP3s while those who prefer watching high quality movies on their Android tablets / smartphones / phablets are out of storage just by adding few Blue Ray movie prints into the device. And those who love high definition gaming find themselves caged with internal storage. Therefore in all such scenarios one has to increase the storage capacity of Android device by purchasing an external micoSD card with significantly higher storage capacity. 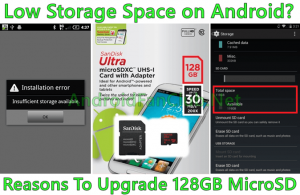 I will list down the reasons why you should Buy high speed class 10 128GB micro SD card for Android and increase the storage capacity of your Android smartphone / tablet. 1. Because your Android phone or tablet’s internal storage is not enough. Though you can try out Junk Files Cleaner on Android to free up storage space. File Managers also allow you to keep track of your storage space and let you know which files & folders are consuming how much storage space. Top 10 File Manager Apps for Android could help you manage your storage space problem manually. I had also covered some Tips to Free Up Storage Space on Android. If you have followed all these steps but still think that your phone’s storage space isn’t enough for your needs, probably its right time to upgrade towards high capacity 128GB micro SD card. 2. You need to add lots of MP3 Libraries / Song Collections and thus internal storage isn’t enough for you. Tryout Best Music Player Apps For Android. 3. You love watching HD movies on your Android device and running out of space. Have a look at Best Android Movie Player Apps. 4. You are HD gaming addict and want to have more HD games on your Android device, due to that you need to buy additional external storage space. Here are some Popular HD Games for Android. 5. SD Card on your device got corrupted & you need to buy new 128GB external storage card for your Android device. 6. You loving shooting HD videos & pictures from your Android device & running out of storage. I had covered Top 15 Android Camera Apps and Best Image Editing Android Apps. Your point n shoot Android camera device (Nikon S810c or Samsung Galaxy S4 Zoom) needs additional storage space for shooting pictures & videos. Its right time to go with high capacity external storage card. 7. You own multiple gadgets & devices, and you don’t want to duplicate your data collection (music / movies / ebooks / official stuff), you can buy high capacity external storage card of 128GB and could easily swap & switch between several devices. 8. You want to keep Backup of your Android apps APK files and thus you need extra storage space. Or you can try Cloud Storage Apps for Backup if you have best internet connectivity around you.9. Love installing custom roms on Android? You should backup stock / default rom on external storage and can easily keep many collections of custom roms on external microSD card.10. Want to Increase RAM of your Android Device? High capacity Class 10 128GB microSD storage cards have higher read / write speeds and thus could be used as RAM on your device. I will recommend you guys to buy SanDisk Ultra 128 GB microSDXC UHS-I Card if you fall in any of the above category. Please make sure to check with your device manufacturer whether your device supports such a high capacity storage card or not, if you own any latest Android device, then it shouldn’t be a problem at all, since new devices easily support storage expansion with high capacity storage cards. If you are successfully using 64GB microSD card on your Android device, its highly likely that 128GB card will also be supported. I was waiting for a solution to expand my RAM for my Asus Tablet model ME 371 since facing the problem of insufficient space when trying to install new apps and guide is the best solution. How to check if my Asus Tablet model ME 371 supports the SanDisk class 10 128 GB micro Card you have recommended? Insufficient space problem is related with Storage capacity rather than RAM of your tablet. In order to expand storage space, you can buy maximum of 32GB external microSD card for your device. If the problem still persists, you need to clear some space on your Tablet, using any File Manager app that shows the DISK MAP, so that you will be able to see the folders which consume your storage space and easily clear those files to get a relief on internal storage.